Our monthly newsletter includes a ton of information which is not available anywhere else, so I thought it might be a good idea to start publishing it on the site as well. You should still subscribe to it though, to receive it fresh off the (digital) press! I’ve been running BerlinGameScene.com since last February, and have been organising Talk & Play for more than two years. I’ve always managed to keep expenses for these activities to a minimum, which wouldn’t have been possible without some amazing venues giving their support (thank you co.up, Supermarkt, Game Science Center), generous companies providing their space (thank you Vescape, Wooga) or technical expertise (thank you Noiza) at no charge, and a number of talented friends helping out (thank you Alfred, Iwan, Jackson, Jasmin, Julian, Luca, Luca, Nomi, Sebastian, Tristan). But. But! I’ve reached the point where external financial support is needed. First of all, because I don’t think it’s fair to ask regular collaborators for favours (meaning to work for free) every single time. Additionally, with a small budget to invest in tools and services, I could do a better job at promoting the local game scene. One example is the plugin I’m using to manage the events calendar on the site, which I know it’s something many of you appreciate: so far I’ve paid for it out of my own pocket, but I will soon need to renew its yearly license. I’ve never planned to get rich (or even make a living) doing this, but it would be great if I could avoid losing money! The best and most sustainable idea I had so far to finance what I’m doing is to publish job ads. This is something that most companies are willing to pay for, and I believe that BerlinGameScene.com can provide a valuable service by advertising job openings on the site, through its social media channels, Talk & Play and this newsletter. Luckily someone seems to agree with me, so I’m happy to announce that the Job Board section on the site is now open! Get in touch if you want more details, and if the company you work for has an HR department, please let them know about this – it would really help. In the meantime, another big thank you goes to TreasureHunt, the first advertiser. What follows is a short sponsored message: don’t skip it! TreasureHunt was founded in 2014 by a group of passionate, creative and experienced game industry veterans coming from companies like EA, Zynga and Kabam. The team has a track record of creating and marketing very successful, and high quality AAA games on multiple platforms. Earlier this year they soft launched in Australia their first mobile release, a 3D adventure game called Boomie Blast Island: watch the trailer and check out its Facebook page to find out more. Berlin, the capital of alternative controllers? It seems so, based on the results of the international Alt Ctrl Game Jam, which saw finefin win the 1st prize with The Zeppelin Game (made in collaboration with his kids), while Firepunchd + team ended in 3rd position with Happy Toy Inc: Nightshift (pictured above together with its controller, a remapped amplifier). You will soon be able to play The Zeppelin Game at the Game Science Center, as it will become part of their exhibition. If you have an iOS device, here’s two new releases to try (they’re both free to download, so you’ve got no excuses): AGRAV by null2 and RGB Smash by Dark Square Games. Teslapunk by klutzGames is now available for Xbox One, with a Wii U version coming soon. Demon Plane (pictured at the top of this page) is the 3rd game created since August by Stupidmindlessf, a new “little punk band that makes games”. My best ranking is Kingfisher. Not a game, but a useful tool for people making them: Master Dungeon by waza!, “a set of modular tiles that can be arranged in a variety of ways to help you and your group to quickly visualize interior layouts from scratch”. Are you interested in games as audio/visual interactive art, with less focus on mechanics or gamer culture? 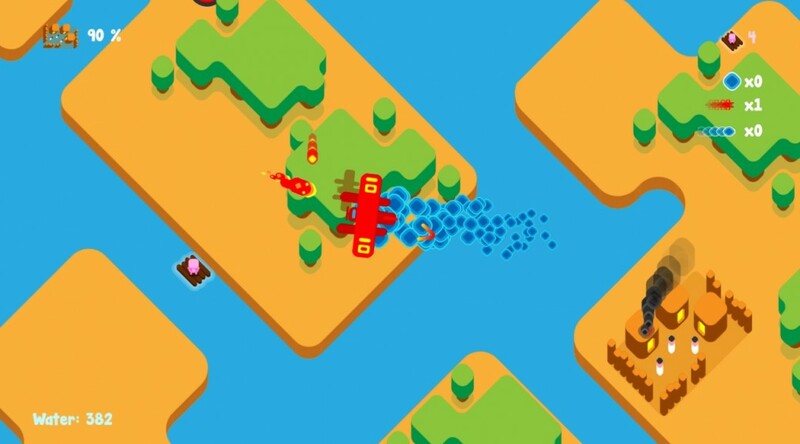 Great, there’s a Meetup group for you now: ★ ąяţǥąʍ€$ ★ (that’s “artgames”). The first gathering is taking place this Tuesday. If you’re the kind of person that likes to work on games surrounded by other people doing the same thing, you should consider joining the Regular Gamedev Meetup, which takes place every Monday from 5pm to 9pm at the Betahaus cafe. Join the Facebook group for more details. Projekt Zukunft launched a competition on “Creative Technology”, which also includes games, of course. Companies from Berlin can submit their projects until November 13th. The competition is endowed with 50,000 euros in prize money. Of Carrots And Blood by Trite Games is now on Steam Greenlight: vote for it. A big recap of Join – 2nd Local Multiplayer Summit in videos, vines, pictures and sounds is now online. Perfect for those who missed it, and for those who want to revive the memories. Louie Roots visited Berlin last August and put together a short video featuring bits of Talk & Play, Kreuzberg, the hardware game jam at Saftladen, me being stupid, Game <3 Cinema and beers. Many beers. Speaking of Talk & Play, save the date: edition #16 is going to take place on December 1st at Game Science Center. Registrations will open two weeks before the event.